Thus spoke Dr. Sutapa Dutta, the youngesgt speaker of the day in Raja Ramamohan Library Hall in Central Kolkata adjacent to CHMC, the oldest Homoeopathy college in Asia. The central theme of deliberation was ‘stress’ in the eyes of a Homoeopathy practitioner. Sutapa was addressing a sizeable select audience of students & practitioners in a seminar conducted by Enclave of Updated Homoeopathy. Dr. Saran Kochhar eminent academician & practitioner from Nagpur presided over. The other dignitaries on dias included chief guest Prof. Dr.Subhasish Ganguli, HOD, Organon & Homoeopathic Philosophy, D.N. De HMC, Dr.Kalisankar Bhattacharya and Dr kalyan Bhattacharya the founder of Enclave. “It may be related with academic pursuit, career race or disappointed love. Social media may also contribute. After academic life starts the professional career. 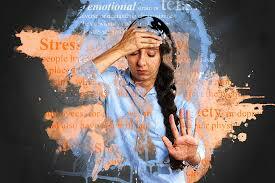 Stress may also arise there from. Old age stress may develop due to retirement or staying far away from dear and near ones. Dr. Dutta enthralled the hall with her compact speech which was full of wisdom. The case she cited from her clinic drew admiration of the gathering. Second speaker was Dr. Dilip Bhattacharyea. His speech was on case taking which he assured, cures half of the problems if accomplished properly. He emphasized on observation vide aph 83. According to psychology observation requires attention and perception. He gave some examples where without asking any question a physician can get valuable information. 1. Forehead sweat in winter indicates anxiety, probably GAD. 2. After conversation with physician occasionally we get patients going and again returning, two or three times, in order to be sure about the dose, repetition, etc. Of the medicine. It indicates OCD due to the persistent doubt. Sometimes we see a patient very keen to see his name properly written by the physician. He or she even dares correction it, if one letter is missed. Definitely this is OCD or OCPD. 3. A patient frequently looks at the watch hints at GAD. 4. When a patient repeatedly asks the physician for fear of cardiac complain, there is every chance of a panic disorder. 5. Slouched sitting posture indicates Depression. 6. Sitting at the corner of the chair points to anxienty. These subtle hints were widely applauded by the hall. The third speaker was Dr Kalyan Bhattacharyea. His topic was Stramonium as a panacea of the day. At the very outset he confided that in his first 25 years of practice life he did not prescribe Stramonium in a single case. It was not only due to inadequacy of knowledge but also due to non-availability of typical cases of Stramonium. “But for last 15 years I am prescribing Stramonium frequently and confidently, This could happen only after developing knowledge of psychiatry and interpreting aph 221 of organon of medicine in the light of psychiatry,” recalled Dr Kalyan. He further gave instances of cases where Stramonium exhibits wonderful results. At the outset, Dipanwita Bhattacharyea the compare introduced the guests. She informed that the enclave, established in Andul over a decade back, has made its second appearance in Kolkata with this seminar. She welcomed the UG & PG students from HMCs & NIH as also the practitioners from far and wide for their presence. Prof Dr Subhasish Ganguli, the chief guest in his address was full of praise thee psychiatric interpretation offered to put homoeopathy to modern practice. He admitted that in this second seminar, he finds much to assimilate for modern homoeopathic practitioners. Homoeopathy is highly relevant and useful to the mankind today, he said. Prof Dr Kochhar in his presidential speech recalled Freud’s statement, “anxiety is the cost that mankind has paid for civilisation. He said that while the last century belonged to pathology, the current one focuses on psychiatry. The knowledge of Homoeopathy needs current medical updates with emphasis on knowledge of psychiatry. Dr Swarat Mukherjee proposed a vote of thanks, reports Dr Vikash Agrawal on behalf of Enclave of Updated Homoeopathy.